Made of VICTREX PEEK-ESD 101, a new bracket technology suitable for use in hydraulic and fuel brackets for the wings, center box and fuel tanks of aircraft can result in significant weight reduction of at least 40% compared to metals. In collaboration with Bombardier and Victrex, the UK-based bracket manufacturer Denroy Plastics Ltd, injection molded the optimized bracket with an electrostatically dissipative VICTREX polyetheretherketone (PEEK) grade, VICTREX PEEK-ESD polymer. The Victrex solution is for the first time specified in commercial aircraft, i.e. Bombardier’s CSeries, Global and Learjet aircraft. 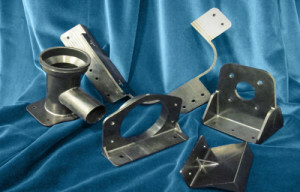 The aim is to replace small to medium-sized machined aluminum and titanium brackets intended to last for the life of the aircraft even though many of these brackets are constantly immersed in fuel. With cost savings and streamlined manufacturing among the advantages of using injection molded polymers, the new bracket technology is now being introduced to the aircraft industry. “Here at Denroy, we’ve invested in a manufacturing cell solely dedicated to the production of PEEK brackets. We have now developed optimized molding processes and invested in new equipment,” noted Jim Knowles, Sales &amp; Marketing Manager at Denroy Plastics. The plastics bracket weighs at least 40% less than its metal counterpart, resulting in significant cost savings in fuel and lower CO2 emission, said Victrex. In addition, cost savings during manufacturing can be achieved due to consolidated parts, integration of complex shapes and geometries, elimination of secondary processing (e.g., machining and painting), as well as by reducing both scrap material and production time. “Victrex is committed to address specific challenges in aerospace such as weight reduction and simplified manufacturing by providing a range of PEEK grades that enable this, including the VICTREX PEEK-ESD polymer,” emphasized Tim Herr, Aerospace Strategic Business Unit Director at Victrex. In the case of the Denroy brackets, to support design freedom, Victrex used special fillers, which do not break down under shear, i.e. when passing through the restricted gate opening. This allows moldings to be produced under the optimum molding conditions without affecting the electrostatic discharge properties of the components, the company explained.